Take the whole responsibility for your Life. Do not let someone else decide what is good or bad for you. Each of us has an inner core in which our peace and bliss lie embedded. These are our ‘inbuilt features’ that were a part of us even as we were created. However, instead of knowing that our core is programmed for peace and bliss, we operate at the periphery. Nothing wrong in flirting with non-essential and periphery things__the materialism that pervades our world__except that we cannot expect to find peace and bliss in the periphery. When we don’t find peace and bliss, we become impatient, distressed, jealous, even angry with Life. And so we start look to Godmen and perform special prayers in places of worship, expecting the cloud to clear. And hope fervently for peace and bliss to descend into our Lives. Interestingly, however, peace and bliss must ascend from within you and not descend into you! And no soothsayer, no Godman, no self-styled messiah can show you the way to your inner core. When you know that you have the ability to Live a Life of purpose, true love, peace and bliss, why would you need someone to assist you? Don’t look outside of you for directions to Intelligent Living. 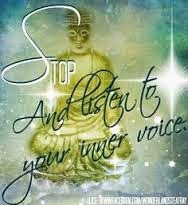 Listen to your inner core, your inner voice, do whatever your true nature is. Even if you go wrong occasionally, you will learn from it, but, remember, you will never lose your way! When you are responsible for __ and in __ your Life, you will find peace and bliss!